Everyone knows it: candy and baked goods are packed with sugar. They’re not good for our teeth and when they’re eaten regularly, they can lead to rapid weight gain and a variety of health problems related to obesity. Although we all know that sugar and especially refined sugar isn’t good for us, what a lot of us don’t know is that sugar can be addictive, in a manner of speaking. What a lot of people are also unaware of is that like sugar, other refined carbohydrates can be often similarly addictive. Worse still, it’s difficult to get away from refined carbohydrates unless you’re very conscious about your diet. Almost any packaged, processed food you’ll find in the average grocery store contains a lot of sugars and other refined carbohydrates and should be avoided. One of the symptoms that you may be addicted to refined sugars and carbohydrates is frequently craving a snack (as in candy or processed salty snacks) in the mid-afternoon and evening. Many of us grew up eating the standard three meals a day with snacks being a rare treat, but now that snacking has become such a common practice, they’ve become a habit with many people, even though most of the snacks people eat have little if any nutritional value. You should also take a look at what’s on your plate at mealtimes. If you’re eating a lot of refined carbohydrates and sugars like white rice, white bread, non-whole grain pasta, you could be in danger of being dependent on these unhealthy foods. Potatoes and corn are also foods which should be eaten in moderation. While they’re fine in moderation, they definitely don’t need to eat these starchy vegetables for every dinner meal. Soda and other artificially sweetened beverages are definitely not recommended as well as they’re loaded with sugar. Refined sugars and carbohydrates cause a spike in insulin levels, which leads to excess sugars and carbohydrates being stored as fat. Since most of us live relatively sedentary lifestyles, we don’t need all of this stored energy – and we end up accumulating fat. The end result is that our addiction to refined sugars and carbohydrates leads to heart disease, diabetes, autoimmune disorders and a host of other problems with our physical and even mental health; there is a growing body of evidence which points to a link between sugar consumption and depression. Nutritionists and physicians have been trying to draw attention to the dangers of sugars and refined carbohydrates for some time, with books by William Dufty, Kathleen DesMaisons and the Sugar Busters series of books aimed at children. Despite this, the high levels of refined sugars and carbohydrates in our diets continue to contribute to a bona fide health crisis, with obesity and other diseases which can be directly traced to diet nearing epidemic levels. The problem is clear enough, but what needs to be done about it? There’s a simple solution, but many people won’t find it easy to implement at first: cutting refined sugars and carbohydrates out of your diet altogether. Everyone knows that we should eat plenty of fresh fruits and vegetables, but these needs to be instead of refined carbohydrates and sugars, not along with them. Healthy sources of protein are also essential; these can be lean cuts of red meats, poultry or fish, eggs and/or vegetarian sources of protein like nuts and beans. Some dark green leafy vegetables have relatively high protein content as well and these are also excellent additions to your diet. When you’re shopping, you need to get in the habit of reading labels. If you see ingredients like dextrose, fructose, maltose, sucrose (anything that ends in –ose) or any ingredients listed as syrup or crystals, it’s probably just sugar. 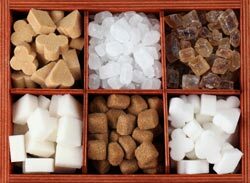 By any other name, refined sugar is still empty calories which leads to weight gain and can keep you craving more. At least at first, it can be hard to make the change. It’s normal to feel irritable and experience strong cravings for sugars and refined carbs at first, but it will pass. Once the cravings fade away, you’ll find that you feel better than you have in years. People may love candy and visits to the bakery, but there’s nothing fun about being a slave to your sugar cravings. Sugar and refined carbs lead to obesity, heart disease and diabetes – and by giving them up, you’ll be doing your health a huge favor and boost! While the Virtual Gastric Band procedure helps with portion control some people need help with their affection for sugar and so I developed a special program and you can discover more about my Sugar Addiction Service for the Metrowest Boston area here.